110 min [ Venice Festival Award Winner. ] - The incomparable Toshiro Mifune stars in Akira Kurosawa’s visually stunning and darkly comic Yojimbo. 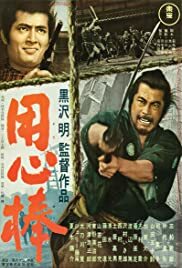 To rid a terror-stricken village of corruption, wily masterless samurai Sanjuro turns a range war between two evil clans to his own advantage. Remade twice, by Sergio Leone and Walter Hill, this exhilarating genre-twister remains one of the most influential and entertaining films of all time.